David Clarke, Homeland Security, Black Lives Matter and ISIS. Milwaukee County Sheriff David Clarke at a Trump rally on Oct. 17 in Green Bay, Wisconsin. Before long, Black Lies Matter will join forces with ISIS to being down our legal constituted republic. You heard it first here. 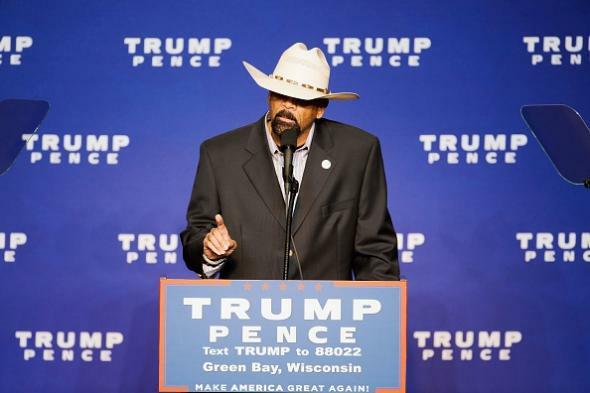 David Clarke is also a member of an anti-government extremist group monitored by the Southern Poverty Law Center called the Constitutional Sheriffs and Peace Officers Association and has appeared on Sandy Hook truther Alex Jones’ radio show.